Just a quick note to say that I will return to blogging about Bob Dylan on Monday, catching up with and finishing 1989. I’ve been able to write some posts while in England, but have not really been able to access the site due to unbelievably poor internet connectivity in my rental apartment. 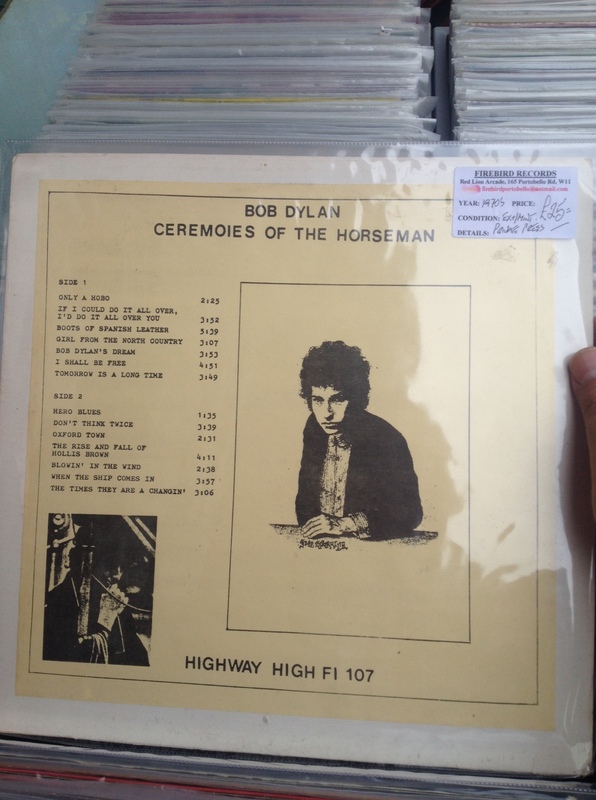 In the interim, please enjoy these photos of Bob Dylan bootlegs that I found on Portobello Road! 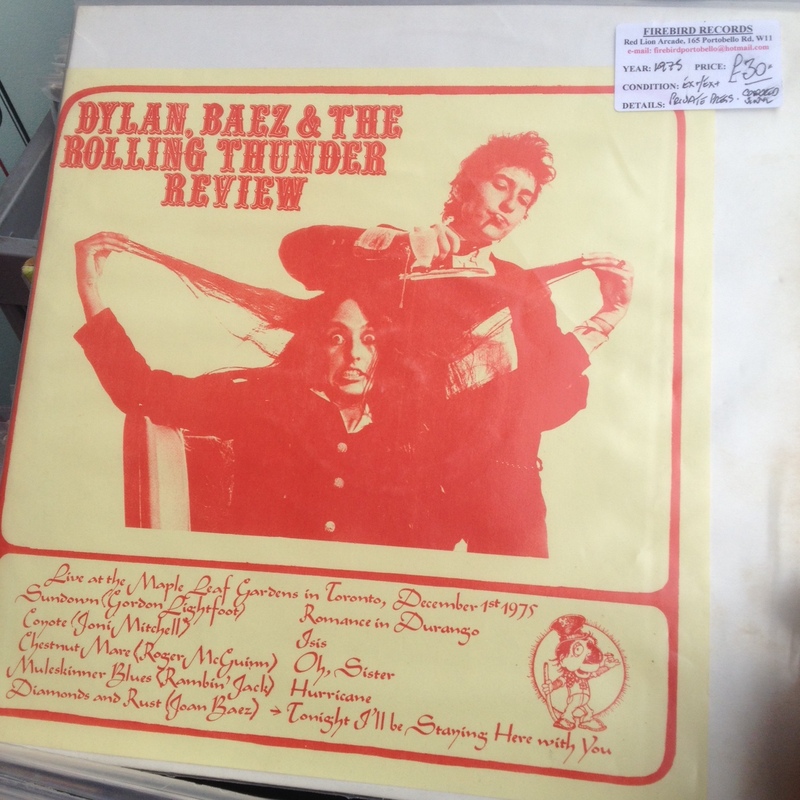 This is a double-vinyl version of the Rolling Thunder show at Maple Leaf Gardens in December 1, 1975. I have this show on MP3 so I didn’t buy it because I would be buying it solely for the fetish value. Note the single-colour sleeve, which is just a piece of paper wrapped around a blank white sleeve. I had never seen this photo of Dylan and Baez previously and now it is just my favourite thing ever. Good show. This is a US release from 1974 of the Witmark Demos, which I have on vinyl on Zimmerman Ten of Swords and on CD as part of the Bootleg Series. It was re-issued a decade later where they fixed the typo in the title. This is just a photocopied sheet on a white plastic sleeve. This is a truly horrible cover on a German LP. This is the first half of Eissporthalle, Manheim from July 18, 1981. To get the whole show you also need an album titled No Sin. I have this on MP3 and I recall that it was a good show. 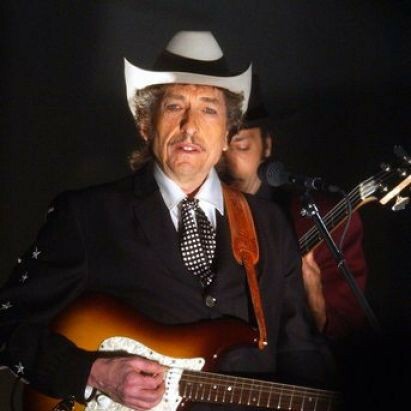 This is from the period where Dylan opened with religious songs, but then also did his hits, which is a good period. Truly an awful, awful cover. For 1974 or so, that German boot cover would just be garden-variety bad; for post 1981, it’s inexplicable. 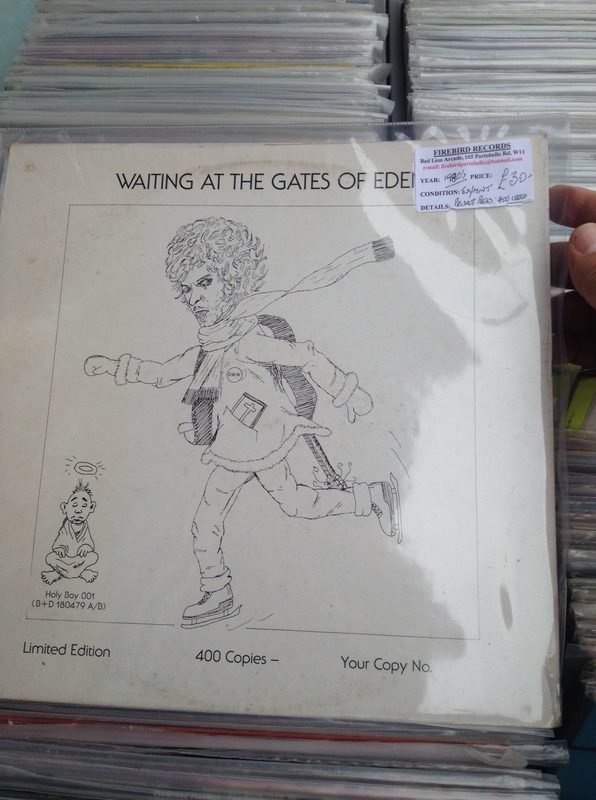 Of course, vinyl bootleggers were never known for their exquisite sense of design.